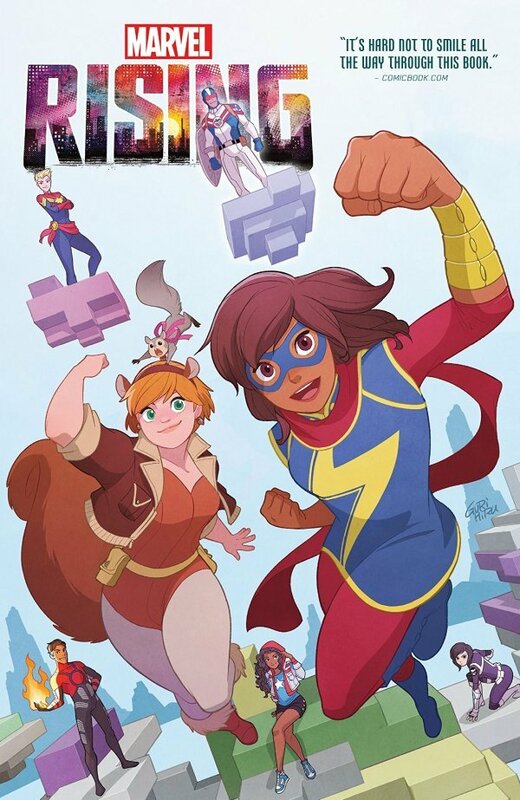 Written by the impressive triumvirate of G. Willow Wilson, Devin Grayson and Ryan North, this trade collects the Marvel Rising #0 FCBD comic, the Alpha & Omega issue and both the Squirrel Girl/Ms. Marvel and Ms. Marvel/Squirrel Girl releases. Structured as a tie-in to the Marvel animated movie of the same name, RISING focuses firmly on two of the characters who have proven most popular with younger readers. Characters whose identities you should probably be able to work out from the list of comic titles I just gave ya. Essentially, the story is based around Kamala Khan and Doreen Green coming together to stop a new villain called Emulator, who, in a superpower perfectly chosen for an all-ages comic, has the ability to bring video games to life. It maybe sounds a little naff or cheesy on paper, but it’s actually pretty cool in execution as we get to see troubled student Ember Quade letting loose with all manner of giant gorillas, dragons and zombies, all while being subtly manipulated from the shadows by a mystery villain. It’s lively, good-natured fun from start to finish, packed with cheesy gags and some great back-and-forth banter from the two leads. It’s especially entertaining that they have both pretty much figured out each other’s secret identities, but neither wants to let slip and risk giving the game away. Older readers may perhaps find it a little slight, but then again they’re not exactly who it’s aimed at, so that’s probably to be expected. Some of the cameos and guest appearances do perhaps feel a little shoehorned in, with American Chavez and Inferno adding little to the proceedings, and I can’t help but feel that the story would feel a lot crisper if it were just based around Kamala and Doreen. That said, the reveal of the aforementioned villain reveal near the end t fits perfectly with the tone and content of the story to the point where I’m almost mad at myself for not anticipating their arrival sooner. The artwork is energetic and colourful, and while there’s perhaps nothing too ambitious here (giant marauding video game characters aside), it crackles with an all-ages dynamism that makes it obvious to see its connection to the Marvel Animated Universe. It’s also worth mentioning that with three different artists across the course of this collected edition, Rachelle Rosenberg’s colour work proves to be absolutely invaluable in providing a real sense of continuity, bringing the slightly different styles of Failla, Srtychalski and Bachs together into a single coherent, flowing narrative. This feels very much like a ‘gateway comic’ for younger readers, designed to provide a fun and upbeat access point into the larger Marvel Comic Book Universe. The storytelling isn’t too challenging, and the brief introductions to the each of the main characters give you pretty much everything you need to know about them. 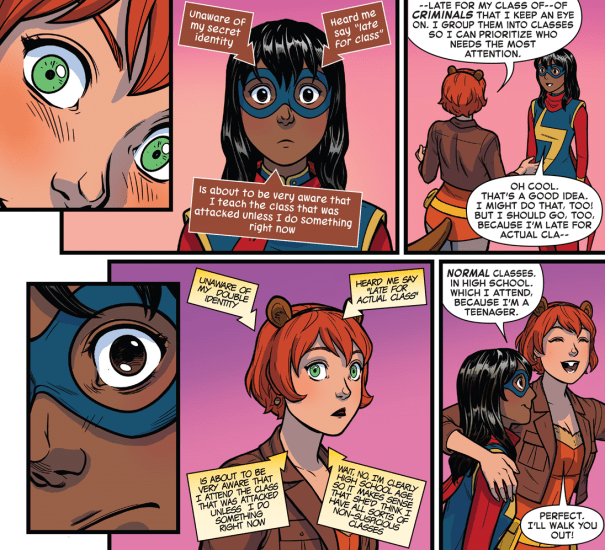 At the end of the day, Marvel Rising feels a lot like a comic book tie-in for an animated movie aimed at younger readers. And while that may sound like damning with faint praise, it really isn’t meant that way. This is a book that knows exactly what it is and who its target demographic is, and in that respect, it most certainly delivers.